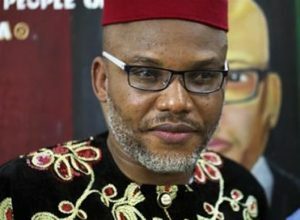 A Federal High Court in Abuja has ordered the three sureties of the self-exiled Leader of the Indigenous People of Biafra (IPOB) Nnamdi Kanu to pay N100m each, into the court’s account over their failure to produce the former Director of the Radio Biafra in court. Kanu who recently resurfaced in Israel after a long disappearance from the public, was granted bail in April 2017 with three sureties, including a serving Senator Eyinnaya Abaribe (Abia, South East Nigeria), among other conditions. Others who stood for the Biafra fighter were two former Ministers of Aviation, Messrs Osita Chidoka and Femi Fani -Kayode. Justice Binta Nyako in her ruling Wednesday held that payment of the sum by each of the sureties within two months. The judgement automatically modified the bail conditions as announced by Justice Nayako on April 27, 2017. Kanu who was arrested in October 2015 in a Lagos Hotel with three others suspects is being prosecuted for alleged treasonable felony. She subsequently fixed Thursday, March 28, 2019 for the hearing of the motions filed by the sureties to challenging the duties imposed on them – to produce the IPOB leader.